A member of the hyperbaric intervention support team, inside the airlock. The workers are often certified commercial divers. Most people don’t think about diving when considering the actions of tunnelling workers below ground, but in fact the two activities can be quite similar. On tunnel boring machines (TBM’s) that are in soft ground and below the water table, the machine is under pressure from the surrounding water, just as a diver would be. Any inspections or repairs to the machine, such as changing cutters or removing obstructions, must be done under pressure. On a tunnel boring machine this process of placing workers under pressure is called a “hyperbaric intervention”. To accomplish a hyperbaric intervention on the TBM, the machine is constructed with an air and water tight bulkhead immediately behind the excavation chamber that houses the cutting head at the very front of the TBM. An airlock is attached to this bulkhead. During normal tunnelling operations the excavation chamber is filled with the ground-up mixture of mud, sand, and rock, usually called “muck”, produced by the cutting head. When a hyperbaric intervention is needed, the muck level in the excavation chamber is lowered slowly and replaced by compressed air. The compressed air holds back the water and loose soil in the excavation chamber so qualified personnel can work there. Workers in the non-pressurized portion of the tunnel can enter the airlock, be pressurized to the same pressure as exists in the excavation chamber, and then, once the pressures are equal, enter the excavation chamber to work. TBM’s mining in solid rock don’t need to worry about holding back loose soil with compressed air, so they don’t need to do hyperbaric interventions. They can work on the cutterhead at normal, atmospheric pressure and use pumps to remove any water that enters the excavation chamber. “Putting people in the TBM under pressure is exactly the same as putting divers underwater. Your body feels the same effects, so we run under the same laws of physics for diving. 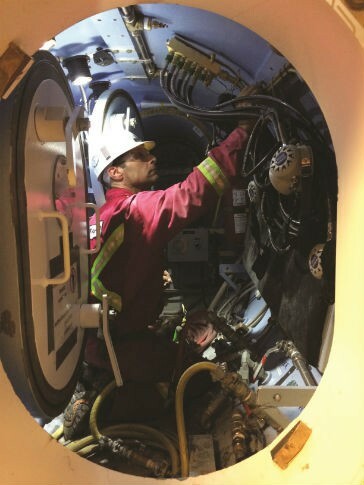 Even though you’re not in the water, your body is still exposed to that over-pressurization,” said Scott Black, group manager for commercial diving and hyperbaric tunnel support at ASI Group. The working time of the intervention depends on the pressures involved. The amount of time compressed air workers can safely work under pressure is determined by the decompression table(s). If a hyperbaric intervention is required, a hyperbaric tunnelling support team would be called in. The team working under pressure usually comprises three individuals: two repair technicians and a third attendant, who is responsible for communications and keeping an eye on the workers to ensure the pressurized environment they are working in is safe. At least two additional workers will stay in the non-pressurized portion of the tunnel and operate the manlocks for the workers under pressure. The process of passing personnel from a regular atmospheric environment to a pressurized space requires an air lock chamber that equalizes the different air pressures through a system of valves and gauges. The air lock chamber is fitted to the front of the TBM, allowing access to the working chamber. The procedure requires workers to enter the air lock chamber where two sets of sealing doors are built in at opposite sides. Once they enter the air lock, the doors are closed and air is pushed into the air lock until the pressure matches the air pressure outside the machine. Once the pressures are equalized, the second set of doors can be opened and the workers can crawl out into the working chamber and begin performing their assigned duties. Black, who started his dive career with the Australian Navy and has over 30 years of experience, said the procedure requires quite a bit of pre-planning. “Putting people under pressure in the TBM is exactly the same as putting divers underwater. Even though you’re not in the water, your body is still exposed to that over-pressurization.” Scott Black, Group Manager For Commercial Diving And Hyperbaric Tunnel Support, ASI Group. Hyperbaric tunnelling support typically takes place between 30 and 120 feet deep. Tunnels that go deeper than that may require TBM workers to enter a saturation habitat, where workers live and work under pressure, sometimes for weeks. Workers who perform in these conditions usually need several days of gradually adjusted pressure to decompress before they can be brought back up to the surface. Along with the constant danger of decompression sickness, hyperbaric intervention support workers also face the usual risks that come with working with any large and complex machinery - including bone breaks, strains or lacerations. Specialized medical equipment is available in the airlock and the attendant, also called a diver medical technician, has a higher level of medical training. A hyperbaric physician is always on call, should more complex medical problems occur. View of the airlock chamber, which is fitted to the front of the TBM, allowing access to the working chamber.